After a traumatizing and life-altering event, children can be emotionally scarred. Although the gift of a blanket is of one of the most simple, it can change a child’s experience. Blankets bring warmth and comfort in a time of confusion and darkness. The gift of a blanket will potentially prevent a child from dying of the cold or illness, as well as giving them something to hold onto while their parents attempt to deal with the current circumstances. 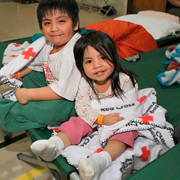 The Red Cross wants to make sure every child can be wrapped in warmth and security. These blankets can go a long way to providing the emotional and physical support of a child. In a disaster, children and families can be at risk of exposure and hypothermia. Give warm, cozy blankets that will help protect the children from the cold, and help them sleep comfortably in our shelters. For $60 you can purchase ten blankets, for $30 you can give five blankets to a child, and for $18 you can help give a child warmth and security with three blankets. These can be purchased online or in our catalog.